The Days of Johann, an agility dog! : The rare and beautiful Polyphemus Moth! The rare and beautiful Polyphemus Moth! We've had another rare sighting here on our Mountain this year! You may remember that we shared with you two Luna Moths that we found this year, one of them just a day or so old and in pristine condition! 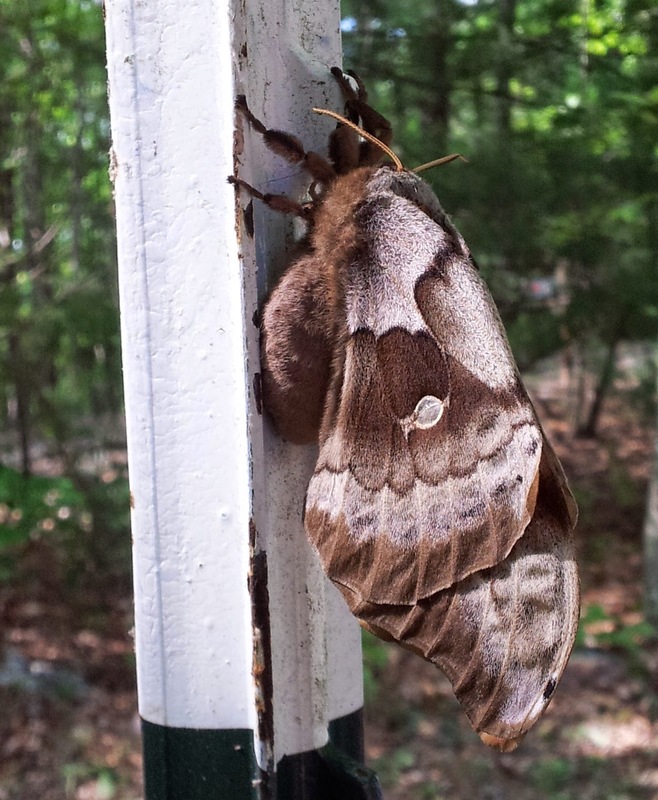 A week or so ago, we found another rarity, a Polyphemus Moth and of course Mum went crazy with the camera! The Polyphemus Moth can be found nearly all over the US, except in the desert states and throughout Canada as well. Like the Luna Moth they are large in size. This one was about 4-5" long, although we didn't get to see it open so we don't know it's wing span. Also like the Luna Moth, the Polyphemus Moth has a very short life span, and that's why it's so difficult to spot them and considered somewhat rare. As adults they live a maximum of only 4 days. Their entire life cycle averages about 3 months from eggs to larvae to pupa and then through adult. Again, like the Luna Moth the caterpillar is green, round and fat, but Polyphemus Moths have single horizontal lines along each side of the body, Luna Moths have vertical yellow lines on each segment. Cool huh? Polyphemus Moths are named because of the large eyespots on their wings; named named after the Greek myth of the Cyclops, Polyphemus. What a shame that they live such a short period of time. They sure are beautiful!